A cryptocurrency (or “altcurrency”) is a digital asset and means of payment which is transmitted through the internet and confirmed by solving cryptographic solutions (or proof of work). The technology protocol usually behind it makes it possible to register all transactions in blocks forming a blockchain that is immutable to change. By having the nodes compete against each other to hash and solve cryptographic keys and/or confirm the correct solutions and trying to agree on a course of action or the state of a system, cryptocurrencies become decentralized. The first widely used decentralized cryptocurrency is Bitcoin, which is a type of virtual currency that is secured by cryptographic encoding and can only be sent or received using a public key, by the owners of the private keys necessary to unlock its value. Users can transfer bitcoin, using a virtual (online or offline) wallet, over the network to do just about anything that can be done with conventional currencies, including buy and sell goods, send money to people or organizations, or extend credit. Most altcurrencies can be purchased, sold, and exchanged for other currencies (crypto or fiat) at specialized currency exchanges. The appeal for these altcurrencies is growing as people find them (especially Bitcoin) to be a fast, secure, and borderless way to transact. Bitcoin’s main innovation and advantage is that it works on a distributed, peer-to-peer system, called a blockchain (a distributed decentralized ledger). As such there is no central server or point of control. Bitcoins are created through a process called “mining,” which involves competing to find solutions to a mathematical problem (or algorithms) while processing bitcoin transactions. Bitcoin miners are able to validate transactions every 10 minutes on average due to the dynamically adjusting nature of the protocol regardless of the amount of computing power (or miners) at any time; essentially decentralizing the issuance and clearing of new currency, replacing the need for a central bank. Furthermore, the protocol also requires reducing by half, the rate at which new currency is generated every 4 years, thereby limiting the total number of bitcoins to just under 21 million coins by the year 2140. Because of this negative fixed rate of coin issuance and its theoretical limit, bitcoin is considered “deflationary” and cannot be inflated above its issuance rate. At a very high level, a transaction is initiated by a random number that generates (by way of cryptographic hashing functions) a private and public key. The public key is further used to generate a Bitcoin address. A virtual wallet is necessary for receiving, storing, sending and managing bitcoins and is the primary user interface for the holder. 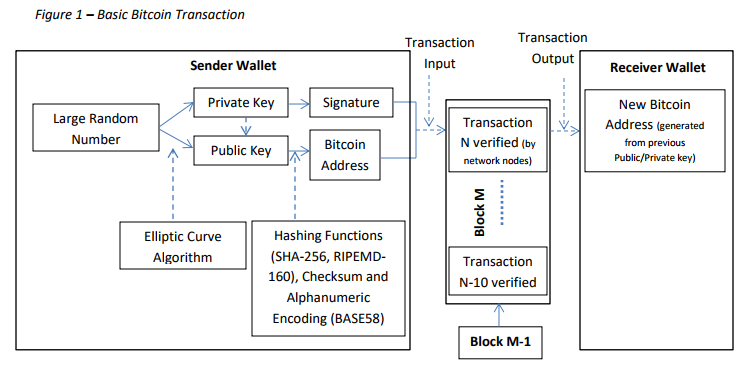 It essentially holds the public addresses and private keys, keeps track of the balance, and signs transactions (see Figure 1). Bitcoin is a money protocol that is built on a decentralized network. Each node is independent and can join or leave the network at any time. While on the network, each node can talk to the other nodes using the Bitcoin protocol. With this protocol, it’s able to script and validate the transactions or other types of digital contracts. Bitcoin is essentially programmable money designed to run on a decentralized network. Since the mid 1990’s, when the internet flourished to become the next information revolution after the digital revolution of the PCs in the 70 and 80’s, financial companies and markets begun to rely on electronic payments as a way to increase the speed, efficiency and reliability of money markets globally. From banks to credit cards and payment processors, electronic transfers, accounting and auditing of funds became the natural norm of a new integrated “real time” world economy. However, the financial markets still lacked a critical component in order to be a real economic revolution as money was still in the form of a fiat currency and use centralized electronic money/centralized banking system. What was still lacking was an independent, decentralized and cyber safe virtual currency in which to transact. The first decentralized cryptocurrency, bitcoin, was created in 2009 by pseudonymous developer Satoshi Nakamoto based on a paper published on 2008. It used SHA-256, a cryptographic hash function, as its proof-of-work scheme. In October 2009 a Bitcoin exchange rate was established at $1USD = 1,309.03 BTC. Then in May 2010, the first real world transaction took place, with a developer purchasing two pizzas for 10,000 BTCs, and later that year Mt Gox, one of the first bitcoin exchanges opened its doors and the market cap reached $1 million. In February 2011, bitcoin reached parity with the US dollar. After the largest bubble burst of bitcoin and the closure of Mt Gox due to the largest fraud on record for this currency, bitcoin began an astronomical ascent, with thousands of companies across industries beginning to accept one way or another payment in the virtual currency. This has only been slightly restrained with the news of governments calling for scrutiny and regulation of the market. In the US, recent moves by the SEC, the Federal Reserve and the IRS have increased scrutiny and oversight, but nonetheless coming short of restricting and imposing further controls. In 2016, Japanese government authorities recognized virtual currencies as a genuine and legal payment method. China on the other hand, after letting the altcurrency market lose for a few years, has started to impose greater controls, with a recent call for an immediate stop of Initial Coin Offerings (ICOs), where startup companies obtain their seed funding through the issuance of tokens usually sold in exchange for cryptocurrencies (mainly bitcoins and ethers). The next major attempt was Namecoin, launched in April 2011 as an effort to provide a decentralized DNS, and avoid censorship in the internet. Litecoin, created in October 2011, was the first currency to use a scrypt as a cryptographic hashing function as an alternative of the one used by bitcoin. Peercoin was then released, using proof-of-work and proof-of-stake as a hybrid protocol to validate blocks. Many other attempts were created, bringing little technology innovation behind the protocol to securely decentralize money issuance and transactions. In the last few years, several modifications have been suggested to the Bitcoin Core (the open source code behind the protocol), including: tackling the issue of scalability in order to become a promising currency for global every day transactions (not purely a means of reserve), finally giving way to a “fork” in August of 2017 (ie. the creation of an alternative modified code), splitting the blockchain in two with the new currency (Bitcoin Cash) and increasing block capacity by eight, thereby significantly decreasing transaction time. What are the main altcurrencies? 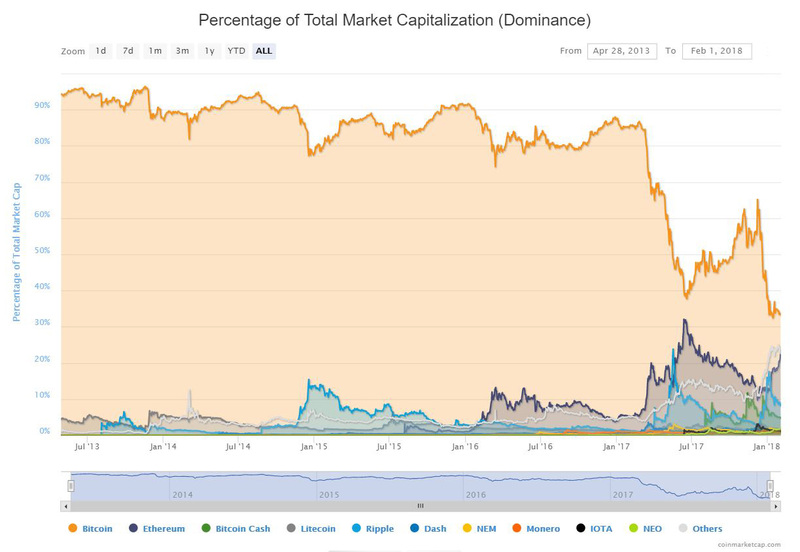 Today, cryptocurrencies have a combined market cap value of approximately $500 billion of which Bitcoin remains the largest one (this number is varying significantly). Ethereum. Launched in 2015, Ethereum is a decentralized software platform that enables smart contracts (ie. contracts where there’s no trusted third party) and distributed applications (aka DApps) to be built and run without any downtime, fraud, control or interference from a third party. Ethereum is not just a platform but also a programming language (aka Turing complete) running on a blockchain, helping developers to build and publish distributed applications. The potential applications of Ethereum are wide ranging. Bitcoin Cash. This is a fully decentralized peer-to-peer digital cash, with no central bank and requires no trusted third parties to operate. As a fork (ie. separation) of the Bitcoin blockchain ledger, with upgraded consensus rules that allow it to grow and scale by raising the block size limit to 8MB (from 1MB), it was born as part of a massive on-chain scaling approach by developers, miners and users who grew frustrated of skyrocketing fees, unreliability and long confirmation delays as a result of the Bitcoin network capacity hitting the ‘invisible wall’ originally set by its creator. The goal of this new currency is to achieve lower transaction fees and faster confirmations, so the network can lure back users, merchants, businesses, and investors. Litecoin. Technically very similar to Bitcoin, but allows a greater number of transactions to be processed by the network in a given time, reducing potential bottlenecks, allowing it to have almost zero payment cost and facilitating payments approximately four times faster than Bitcoin. 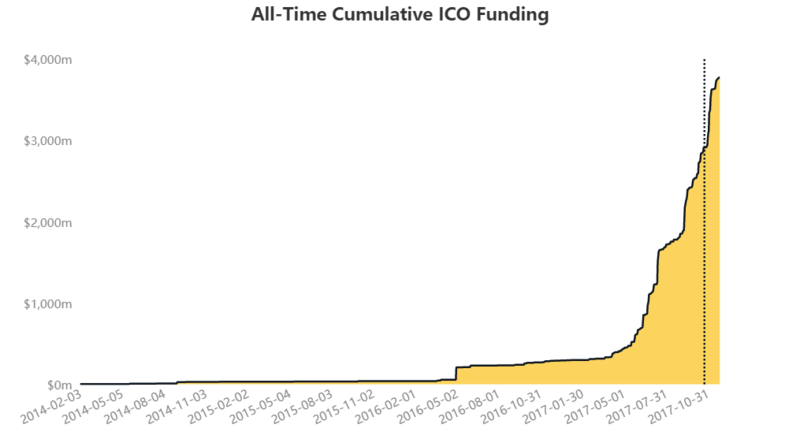 It became the first altcurrency to adopt a revised network verification protocol (Segregated Witness or SegWit) using an extended block for witness execution and virtually increase the block size thereby achieving faster confirmations as well as Lightning Network, a peer-to-peer system for making secured micropayments of digital currencies routed across payment channels with ultrafast payments and reduced blockchain load. Conclusion: What are some of the applications for cryptocurrencies? Although bitcoin and its blockchain protocol were created primarily with an economic motive, its actual and potential applications are significantly broader. Besides serving as a reserve currency that cannot be manipulated by central banks, these currencies (especially bitcoins) can be used to facilitate peer-to-peer transactions as well as any kind of transaction easily and safely, and soon it will be done swiftly. In addition, the blockchain protocol and different verification methods and technologies around cryptographic hashing have given life to decentralized applications (dapps) besides wallets for peer-to-peer (P2P) payments. These include smart contracts that use the distributed ledger to keep track of states of the contracts, from title to insurance to financial derivatives clearing. In theory, a true “leaderless” company, or Decentralized Autonomous Organizations (DAO for short), with a given set of voting and governance rules, can also easily be designed to be funded and run following preprogrammed smart contracts voted on by any participant individual who holds DAO tokens of buys them. Recognizing these advantages, since 2016 startup companies (especially the ones working with blockchain Dapps) have begun issuing Initial Coin Offerings or ICOs, selling company tokens in exchange for altcurrencies (especially Ethers).